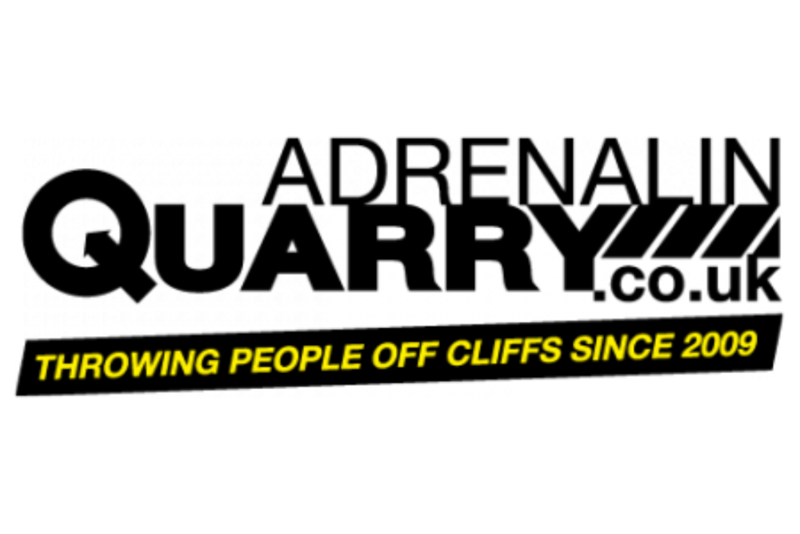 There’s more to Adrenalin Quarry than being thrown off a cliff. The venue and rides have been uniquely designed to be safe for families yet thrilling for adrenalin junkies. That’s why it's consistently voted one of the best things to do in Cornwall by the national press. JUMP OFF A 50M CLIFF AT 40 MPH! 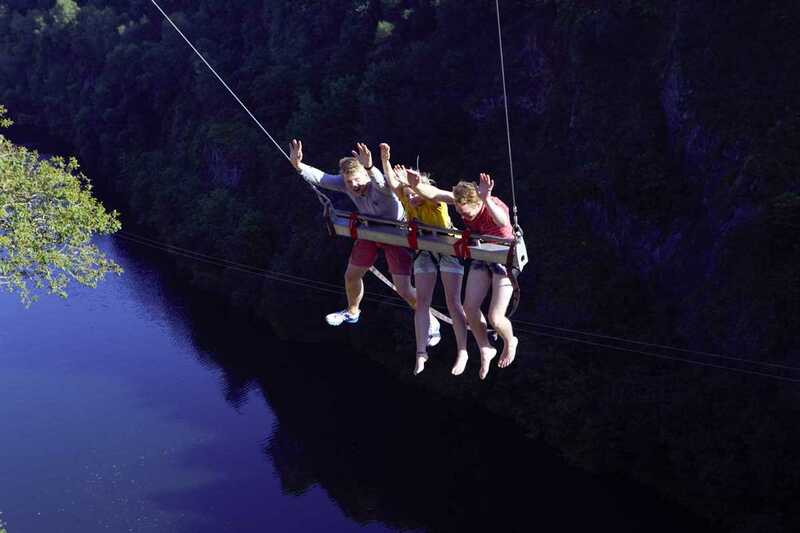 The Zip at Adrenalin Quarry, in South East Cornwall, is the UK's biggest ever zip wire. Longest at 490m; highest at 50m; fastest at 40mph. Twin parallel wires cross the flooded depths of the old quarry, sheer cliffs rise on either side. NO NEED TO BOOK, The Zip is the only place in the UK where you can just turn up and jump. No fuss, no pre-booking, no hours of waiting around - we throw you off our cliff within minutes of arrival. Coasteering at Adrenalin Quarry is unique. We’re the first Cornwall coasteering venue where the action’s all freshwater and children aged 10 or more can join in. We’re the only coasteering venue in the world where you feel like you’re on the set of Jurassic Park. Go wild swimming, traverse rockfaces, climb sheer cliffs then jump no-strings-attached into the lake. If you want your Stag or Hen Party to start at 100% and then gather speed, Adrenalin Quarry in South East Cornwall should be your main event. 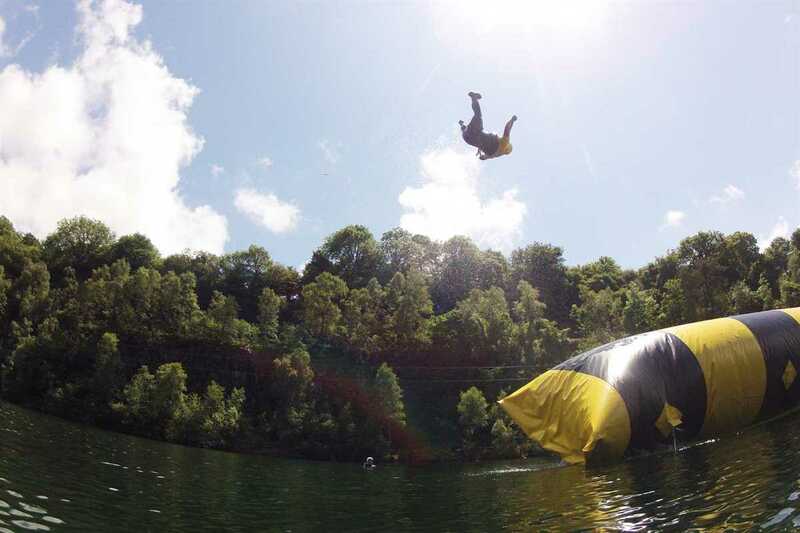 Take on Zip Wires, Coasteering, a floating Giant Inflatable Catapult and the massive Cliff Top Swing in an overdose of adrenalin activities that’ll have the groom or bride-to-be grovelling for mercy. Our quarry is a stunningly beautiful yet unforgiving arena of vertical cliffs, wild woodland, a deep, dark lake and 100% adrenalin-fuelled fun. It’s the ultimate environment to challenge, entertain and motivate your team. Ever felt like throwing your team off a cliff? Now you can. And they’ll thank you for it. Development training days at Adrenalin Quarry do not include psychobabble and flip charts. We provide an escape from all that. 150ft cliffs tower over a tranquil flooded quarry lake. 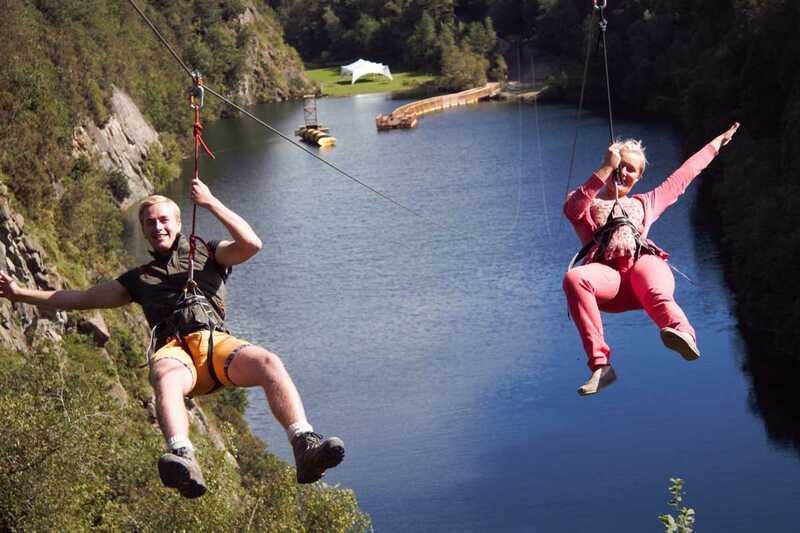 Twin aerial zip wires descend to a lush lakeside lawn. All this surrounded by woodland in a secluded wildlife haven. When planning a wedding in Cornwall, you’re spoilt for choice. At Adrenalin Quarry you get something completely different and a wedding album that’ll blow others out of the water.